Assortment of 56 Regina Oro and Extra (grey) freewheel cogs all NOS - many great sizes! 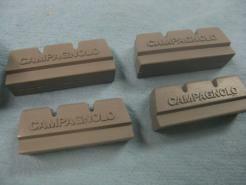 Campagnolo Crown race cutter - just the cutter tool - NOS in sealed container - Campy tool goodness! Campagnolo Syncro 2 shifter set NOS boxed - with black insert beautiful! Campagnolo Syncro 2 shifter set NOS boxed - with blue insert beautiful! Campagnolo Syncro 2 shifter set NOS boxed - with green insert beautiful! Campagnolo Syncro 2 shifter set NOS boxed - with red insert beautiful! Campagnolo Syncro 2 shifter set NOS boxed - with yellow insert beautiful! Campagnolo Triomphe Shift Lever Set Braze-on NOS gorgeous! Campy spacer set to mount single chainring on double crank - genuine Campy Nuovo Record! Clement Cycling Cap - made around 1980 white - really nice - label has a bonus! Clement Cycling Cap - made around 1980 Yellow - really nice - label has a bonus! Italian Moa Vintage Cycling Shorts size 4 - acrylic but looks just like wool - for Eroica? Rear fender reinforcement diamond shape gorgeous! Regina Oro 5sp 14-28 Freewheel in the box - found some more! Shimano 7400 BSC bottom bracket NOS - also fits Campy NR/SR! Shimano DuraAce 7402 Italian Loose Ball bb gorgeous! Shimano SLR brake cable set white housings front and rear NOS bargain! Stronglight French cup pair - NOS no lockring - super price! Sugino SP-H 26.4 seatpost - very snazzy NOS - fits many french bikes! Suntour Cyclone Group NOS boxed 172.5mm BSC - rare to find complete! Tange ''Large'' Chrome Cinelli Style fork for 700c short reach brake racke bike NOS gorgeous chrome! Tange ''medium'' Chrome Cinelli Style fork for 700c short reach brake racke bike NOS gorgeous chrome! We found more - Campagnolo Really Old Grey Cable Housing for derailleur or brake - similar to Universal housing too!